Dot Registry LLC, A Kansas company which applied for the gTLDs .llc, .llp, and .inc as a “Community” applicant and the second new gTLD winner in the ICANN Independent Review process IRP (Dot Registry, LLC v. ICANN (.INC/.LLC/.LLP)) has filed an Amicus Curiae Brief in support of Appellee .Africa Applicant DCA Trust. Dot Registry, LLC submits this amicus curiae brief in support of Appellee DotConnectAfrica Trust (“DCA Trust”), pursuant to Federal Rule of Appellate Procedure 29. Like DCA Trust, Dot Registry is an applicant to operate Internet registries maintained by Appellant Internet Corporation for Assigned Names and Numbers (“ICANN”). Dot Registry therefore has significant familiarity in how ICANN manages its application processes and a significant interest in this Court’s interpretation of ICANN’s guidelines. DotRegistry had lost its Community Priority Evaluations after ICANN’s decision to refuse “community” status for three applications. The ICANN Board Governance Committee (BGC) in particular was blamed for having blatantly and repeatedly failed to carry out its oversight duties. With the panel writing that the BCG’s analysis was “simply not credible.” saying “the record makes it exceedingly difficult to conclude that the BGC exercised independent judgment. The company has formally writen to the court to join DotConnectAfrica who is the first new gTLD IRP winner. In DCA’s case, ICANN’s staff not only coordinated repeatedly with the “independent” geographic evaluator InterConnect to undermine DCA’s application, but later redacted all records of its interference from the final ruling. ICANN failed to act on the IRP ruling, eventually forcing DCA Trust to sue ICANN in court on January 2016 winning won two injunctions (temporary, March 4th 2016 and preliminary, April 12, 2016) that have rendered .Africa domain un-delegated. This Court’s interpretation of the enforceability of Module 6.6 under California law will likely have a significant impact on Dot Registry’s ability to pursue its rights if the ICANN Board does not act to give effect to the IRP Panel’s decision, as well as the rights of other aggrieved applicants. DotRegistry argues that the District Court was correct to hold that there were “serious questions regarding the enforceability of the Release,” and the judgment should be affirmed. Its main arguments are in the enforcability of the new gTLD applicant guidebook ‘covenant not to sue’ clause, which DCA had successfully told the court were unenforceable in law. ICANN thereby exercises sweeping power that affects literally billions of Internet users throughout the world. See 4 ER 730. Given ICANN’s unquestionable monopoly power over these vital channels of commerce, it is critical that ICANN exercise that authority through an open, fair, and transparent process governed by law. Unfortunately, ICANN has used its dominant position to create procedures designed to insulate its decisions and processes from scrutiny. In 2012, ICANN launched a program to greatly expand the number of available gTLDs to consumers. ICANN began accepting applications from entities that seek to obtain the rights to run and operate registries for the newly available gTLDs. As part of that application, ICANN required each applicant to agree to the rules and terms and conditions contained in the Guidebook, a 338-page document that governs ICANN’s application, evaluation, and delegation process. The Release is procedurally unconscionable because it is oppressive and disappoints the reasonable expectations of the applicants regarding the accountability mechanisms available to challenge alleged misconduct on the part of ICANN. As discussed above, ICANN has a monopoly over the process of awarding and delegating new gTLDs. …..Moreover, although claiming to provide an alternative accountability mechanism, the Release, in practice, is just a bait-and-switch scheme, offering applicants a sham accountability procedure. Indeed, at the time ICANN solicited applications for the 2012 gTLD process, it was not apparent that ICANN would treat a final IRP declaration as merely advisory or that it would take the position that the IRP tribunal could not provide any remedy for a violation of the ICANN Articles of Incorporation, ICANN’s Bylaws, the Guidebook, or California or international law. ICANN contends that the Release has a “well-founded justification,” because of its fear of “frivolous and costly legal actions” brought by “unsuccessful applicants.” (ICANN Br. at 41.) Yet ICANN offers zero evidence that it faces a particularized fear of frivolous litigation, or that in the alternative, a mutually binding arbitration could not address that concern. ICANN could similarly protect itself against the unjustified expenditure of legal fees through contractual fee-shifting provisions or the like. What ICANN is seeking to do through the Release, however, is protect itself against accountability, not frivolous litigation. Indeed, the Release’s non-mutuality only emphasizes its wholly one-sided nature. The terms and conditions applicants must accept to participate in the gTLD application process favor one party and one party only: ICANN. In accepting the Release and its related conditions, applicants not only release ICANN from “any and all claims” arising from the application process, but also agree to “indemnify, defend and hold harmless” ICANN from and against “any and all third-party claims, damages, liabilities, costs, and expenses, including legal fees. 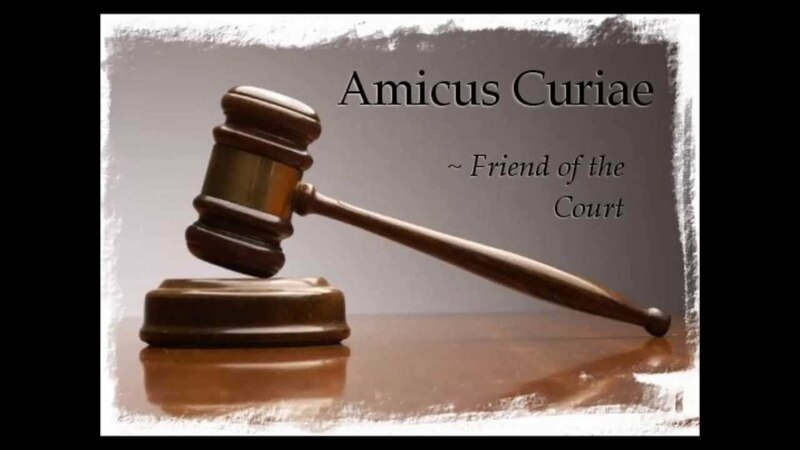 This amicus curiae application could mean alot to the on going case.